(CNS): Having been given at least seven long bills on Thursday evening just a few days ahead of a business committee meeting at the country’s parliament on Monday, Ezzard Miller said the interim government’s efforts at consultation fell far short. The independent member for North Side said the stop-gap Cabinet had essentially presented the stack of bills it wanted passed and then asked for support from the two independent members and the opposition but they had not consulted with them on the content. Miller said that he would offer his support on some of the legislation but real consultation would have included all members in the process before the bills were finished. He could offer his support to some of the bills, he said, but he had been given very little time to read and consider thelaws and amendment, never mind consult with his constituents about their possible impact. “My recommendation is that the government delay parliament until next week to give us all time to consider the bills and consult with the people on what we can support, what needs to change and what cannot be supported. I already have concerns with the health practitioner’s bill and, given the lack of time to discuss all of this legislation, I won’t be able to offer my support,” he added. With the interim government in a minority, the new Cabinet is dependent on four other MLAs from the opposition benches, their former UDP colleagues or at least two of those members in combination of the two independents to pass any legislation before the Legislative Assembly is prorogued ahead of the 22 May General Election. 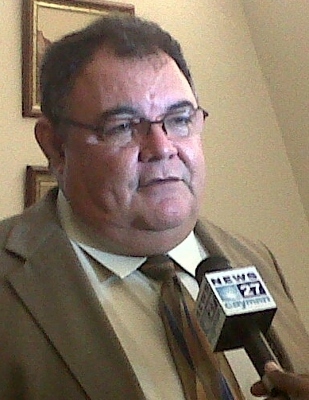 Despite the minority government’s inadequate consultation, Miller said that the arrangement following the fall of the original UDP government had gone reasonably well. He said that he had not expected any major change when he supported the remaining five former UDP members holding office until the national polls as they were the same government. However, Miller said he welcomed the move by Cabinet to re-introduce the weekly press conference. “This is a move in the right direction and, if I am in government on 23 May, in addition to weekly press conferences I will have a weekly open house one day a week for anyone to come and ask questions," he added. The Legislative Assembly is scheduled to meet on Wednesday morning at 10am and the interim government has a number of laws it needs to push through, including bills related to the budget and fee increases, various health related laws, including the Organ Donor Transplant Law, which is one of the conditions government must meet in connection with Dr Devi Shetty’s hospital project along with the Health Practitioner’s bill. The Marine Conservation law is also being amended, among other,s to protect several species of local rays throughout all of Cayman waters. Comments are not addressing the real issue in this article which is that these are the same ol' Bush cronies in action. If they were interested in hearing anyone else's opinions they would have granted them the adequate time to consider the validity of the bills. Now nothing will get passed and ex-UDP cabinet will blame opposition for not working with them and blocking the effective operations of this country. Why would anyone support a bill that they hadn't anaylized. The lot of these former UDP members need to join the unemployment lines in May! Please do not allow any of these derelict, corrupt, so-called politicians make any more laws on our behalf. We simply do not believe them any more. No more laws! Guys, just be quiet and stay home please. After we have voted, we'll let you know if we want to hear from you, so please button it until then. Do your job Ezzard, stop complaining. The organ transplant bill has been discusses since the Shetty Hospital was envisioned. Absolutely nothing they are presenting is new, AND its a minority government, they need consensus, so they had to talk to some people, float the bills around etc, before hand. Stop complaining and get to work. The less time we have to put up with him bitchin’ and complaining about all and sundry, the better it is for all. Can’t expect too much more from former UDP members. We won’t see a real change until the election when they all get voted out. What happened to the 21 day publication period for bills? Here we go again! When can the public see these bills? So, in other words, Ezzard is complaining he has some work to do and a tight deadline to get in done? It means that he gets lets chance for self-publicity on radio slits moaning. Why don't we know which bills Ezzard supports, the Environmental Bill amendment wouldnt happen to be one that he disapproves of, would it? Come on CNS, give us the complete story so that we know how our MLA's are behaving in our name. Why don't you jump on your own bandwagon. Ezzard is a moaning pest who fails to look after the whole of his Northside district with equality and diligence. Until he actually does something that is for the benefit of his own district, he can get lost. Excuse me?!! Ezzard has done more for his district that any other MLA. Who was it that formed a district council before any other MLA? Who was it that got CCTV for his district before there was even a national plan to implement them. You just hate Ezzard. It has nothing to do with his record of performance as an MLA. Can you imagine Miller trying to cope in the real world?! Bills are presented in Congress and House of Commons on 24 hours notice! This man has an opinion and everything yet absolutely nothing!! To be fair, in Congress and the House of Commons the legislators have many assitants and researchers and advisors to review and comment to help them digest the bills. They do, and it makes people very angry. Wouldn't you like to know what's in these proposals before they vote? Exactly, why isn't he jumping his rotund stature up and down at the abuse of public funds paid to so called 'Park Rangers' by McKeeva from the Nation Building Fund. Are those people listed as taking as much as $78,000 in return for a position that is totally unnecessary already employed or self employed. My bet is that they are, so why isn't Ezzard coming out fighting and demanding that this vote buying stunt is abolished. Barkers is not an official National Park so therefore does not warrant special rangers to do the job that the Parks and Cemetaries guys do on the rest of the island for a fraction of the money. I suppose he'll come out and say that it is employing Caymanians, that may be true, however they did not go through due process and are possibly already employed in any case. All they've managed to do is pay out money that should have been spent on legitimate national projects and not helped any Caymanian who is genuine need of employment. Don't complain then when expats take legitimate employment, at least they conform to the rules. Marine Parks are a National Park, an environmental treasure and a national asset. However, Ezzard is quite happy to support his local 'fishermen' and demand the abolition of the Rum Point Marine Park so that they can destroy 25 years of marine conservation that was originally undertaken on behalf of all the Caymanian people. But where is the money to pay for Marine Park expansion and protection, where is the money for DoE Marine Enforcement personnel, not enough votes in it I suspect? Stop trying to be clever Ezzard, firstly it doesn't work and secondly try sorting out your own mess in Northside before trying to play politics around the rest of the island. The fact is PROTOCAL dictates that members be given 21 days before the bill makes it to the floor of the house. I can understand there being those times when that is not possible. But for goodness sake, this has been the practice of the UDP/FAB5 Government from day one. Bullying their way through. What kind of democracy is it when rules aren't followed?! Whats a PROTOCAL? Is it the same thing as a protocol? The fact is some of these bills have been sitting out there for months all accessible to the MLA’s it is just obstruction and not wanting to actually have to earn their salaries that is involved and if Ezzard has to take time away from bloating himself up by doing an honest day’s work instead of always grabbing for press attention then he will do all he can to obstruct. Those in the northern district have my sympathies as no candidate seems to be stepping forward to challenge this puffed up frog.